4th time the charm for revitalizing this 5-acre riverfront deadzone in Saint Paul, MN? The folks in Saint Paul, Minnesota have envisioned redeveloping and revitalizing their riverfront for a long time. Three previous attempts have gone nowhere. Like so many waterfront cities around the world, badly-planned transportation infrastructure has long separated neighborhoods from the revitalizing power of water. The site as it looks today. Now, they’re ready to try again, and the design-build giant AECOM is the key private partner this time. 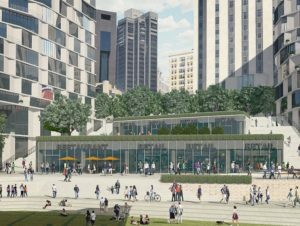 On November 20, 2018, Ramsey County (the owner of the site) approved negotiations with AECOM for redevelopment of the vacant, 5-acre downtown site on the banks of the river. It’s situated between the Intercontinental Hotel and the Science Museum of Minnesota., both of which would benefit tremendously by seeing this dead zone brought back to life…as would the entire community. The AECOM plan includes four proposed buildings, and will cover this portion of both Shepard Road and the riverside rail line, to directly connect downtown to the river upstream from the Wabasha Street Bridge. “We wanted to be very cognizant about how we connect this site to the downtown street grid and then to the riverfront. Instead of a wall, like the old West Publishing site, we actually open up the buildings,” said Brian Dusek, AECOM’s managing principal for real estate development. Previous redevelopment attempts failed to properly reconnect the city to the river. The AECOM proposal fixes that problem by putting a lid over the existing infrastructure, as we’ve seen in so many other smart urban projects here in REVITALIZATION. Covering—rather than removing—poorly-planned urban highways and rail lines provides the best of all worlds: it retains the traffic capacity while healing the devitalizing fragmentation. Design with the site’s context in mind and as a continuation of the urban fabric. A Request for Development Interest (RFDI) was initiated in the Winter of 2017. The county met with 10 interested groups, and created a short list pf 4 teams, which merged into two groups. Interviews with community stakeholders and leaders from the City of Saint Paul followed, leading to the current stage. All images courtesy of AECOM. Learn more about the riverfront revitalization (PDF).